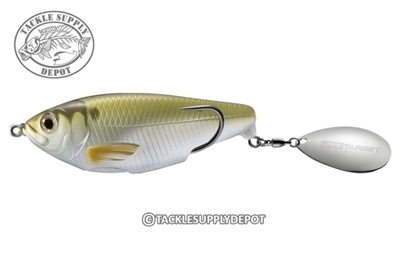 The Commotion Shad by LIVETARGET is a life-like hollow body bait which generates a tremendous splash and noise that is inviting to surface feeding Bass and Northern Pike. With its realistic profile and attention to detail, this bait replicates a juvenile Shad with remarkable accuracy. The custom extra sharp wide gap double hook was designed specifically to maximize hookups. The rear-spinning blade is custom designed to generate powerful splashing, a broad bubble trail and a deep penetrating "blooping" sound that will call fish in from a distance. When fishing topwater commotion calls to those lurker lunkers. i like the lure alot! cool! thanks!